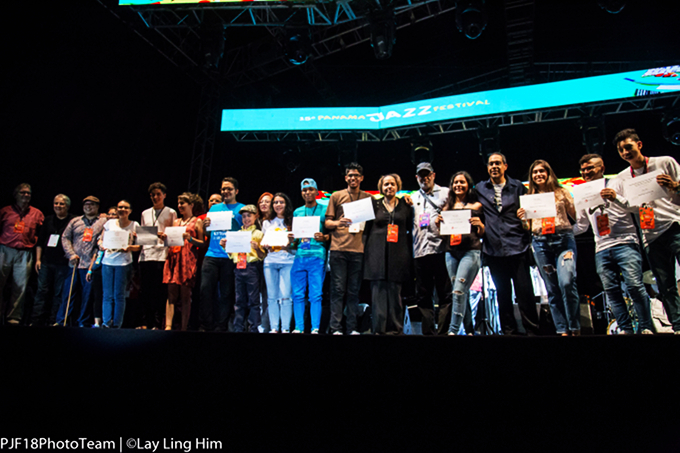 Danilo Pérez and those who won scholarships at the festival. Probably to more Panamanians than those with other perceptions, the Panama Jazz Festival is this annual open-air free concert and traffic jam in surrounding areas. That it was on Satuday, January 20 when a large crowd in the old Fort Clayton parade ground was entertained by Lefty Pérez and Wichy Camacho, La Kshamba, the Colectivo Calipso, the Panamonk Trio, jazz ensembles from the Berklee Global Jazz Institute, the Thelonious Monk Institute and the New England Conservatory, the Pan-African Jazz Project and the Yogev Shetrit Trio. But for a bunch of young people and a few adults who teach or perform for a living, the highlight of the day’s festivities was the scholarship awards ceremony — and some of those who didn’t get scholarships nevertheless during auditions over the days of the festival did get admitted to some internationally respected schools of musical education. Know ye that the Panama Jazz Festival has long gone beyond jazz, with a classical component all along and incorporating a number of other genres all along, and in recent years expanding to include an annual Latin American music therapy summit. So all seminars, and all scholarships, were not necessarily for jazz. Winning the full scholarship to the New England Conservatory Jazz Lab this year was a Costa Rican, guitarist Natalia San Lee Salazar. Chilean violist Brian Urra got the Patricia Zárate scholarship for academic excellence and social work. Berklee College of Music summer school scholarships went to Óscar Cruz (percussion), Gilberto Campos (drums), Susana Arcia (cello), Sophia Fernández (vocals), Juanita Acosta (piano), Samuel Barrios (piano) and Erick García (violin). The musically advanced Crossroads High School in Santa Monica, California gave scholarships to guitarist Victoria Rosas, saxophonist Oliver Mall (saxofón) and percussionist Lucas Maylín. Gotta get that Gringo pronunciation of “water” down! Kevin Harris, a pianist and Berklee piano teacher, who in Panama has developed a following as an apostle and instructor of gospel music. Photo by Eric Jackson. Due to conflicting commitments and a low bus fare budget, The Panama News coverage of this year’s Panama Jazz Festival was relatively abbreviated. 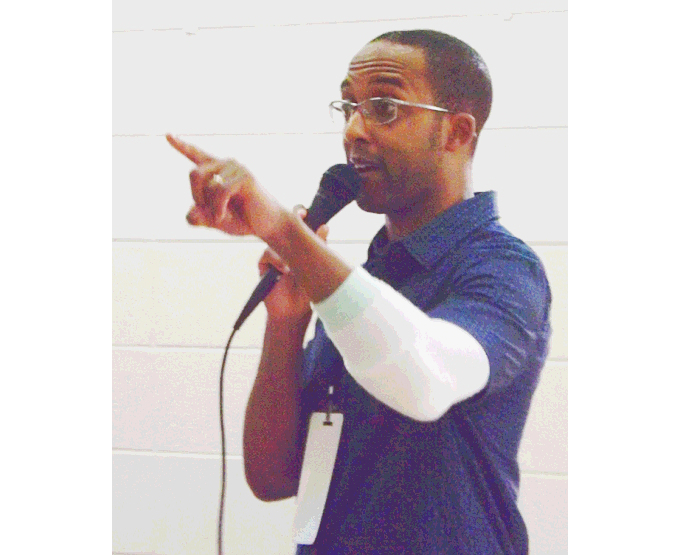 This reporter, however, did catch a part of one of Kevin Harris’s three black gospel music workshops. There was a crowd of newcomers and regulars, mostly youngsters from Panama but with a senior European visitor next to me and a bunch of teachers of various descriptions mixed in. The young translator — the jazz festivals also educate these — could stand an English immersion, for this line of sessions better yet a Black English immersion, but she could make Harris’s English-language instruction understood well enough. You may correctly associate that with the black churches of the USA, and with the civil rights movement of some decades back. But this is not a song about being baptized so as to pay tithe to the reverend and so on. Its author is unknown because in slavery days it was downright dangerous to be known as the author of such a thing. It was a coded escape message, advising slaves to wade through streams to get the slave catchers’ tracking dogs off of their scent if and when they ran away toward freedom. There were some interesting logos and uniforms in the audience. Was the Banda León de Judah of a Rastafarian denomination? If haled before Mutabaruka’s court, would they be found irie? In any case, figure that one of the main things going on in the room was the improvement of a number of Panama’s church choirs.